Why is it that the weeks leading up to a vacation are always the craziest? Luckily, I have also realized that I am my most-productive in these weeks, too, so I was an absolute mad woman with my to-do list this week, thankfully. Today, it's officially VACAY for me and I couldn't be more relaxed! Well, I do need a Diet Coke and the machine downstairs is jammed (and ate my money, the nerve), so maybe if I had that, I would be even more relaxed :) Even better, we are headed off to the unplugged basics of the mountains this weekend, and there, I will be the most relaxed. Ahhh. I can feel and hear the silence of the mountain air already! Speaking of the basics, I had a great request from a fav reader this week about shoes. My favorite topic. She knows me too well! The question was specifically about work-appropriate shoes for the summer, closed-toe and black or other basic colors. While I am one known to "dress down" a pair of sparkly heels for the office, a gal definitely needs the basics in her shoe wardrobe, too. Luckily I know a few options to help you all out if you are on a similar hunt. Sure, peep toe and strappy sandals may be all over the shelves for the season change, but there are other options if you know where to look. 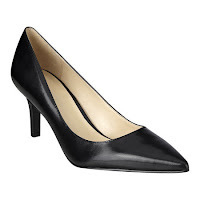 The best news is that a basic pair of black pumps does not have to set you back $1,000 if you can't afford it. My tricks are to stick with name brands that continuously stock the basics. These babies from Nine West are typically available at any Nine West store, and are definitely available year-round at the outlet locations. In Atlanta, try the outlet up 400, and look in the back of the store. They always have them in stock. These have been my favorite go-to shoe for over seven years, and they are incredibly comfortable for an entire day (or night). Right now I own them in a patent black, brown leather and patent maroon (the outlet carries fun, random colors from past seasons). I take them to the cobbler regularly for taps, and then replace them every few years as the arch gets worn out and the tips are too far gone for a touch-up. Luckily, they are only around $65, so per wear, only a penny or so for me in the end! While those have a 3.5 or 4 inch heel (my personal preference), if you need/enjoy a lower heel, Nine West has some of those too ($79). It's important to remember, black doesn't have to mean boring. Little accents can make all the difference. 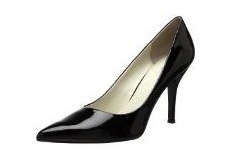 These uber-professional black d'Orsay pumps from Nine West have a little extra style with the cut-out sides ($120). Sometimes you can find fun basics from brands that might not be top of mind, too. These DSW finds are from Adrienne Vittadini. I can't vouch for comfort, but that bow sure is cute! 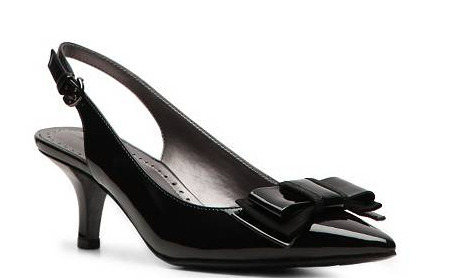 These would be fun with a pair of cropped pants in 1960's style. No matter your choice, basic black shoes can be fun and anything but basic. In the summer, I like to wear mine with bare legs, a brightly-colored dress and coordinating black accents like a thin belt or black purse. They also make the easiest outfit in the world when combined with a simple gray or black shift dress. You will be amazed at how fast you get out the door in the morning when you throw those together. Add a bright bracelet or necklace for a pop of color. I live in my Jessica Simpson pumps during the week - they are so comfortable. I have a black and beige pair. DSW always sends out coupons for $10 off and they offer free shipping, I really appreciate that convenience!